Sixteen days into the investigation of one of the most tragic and horrific mass murder in the history of our nation and suspicions as to the who, what, when, where, why and how of it all are only deepening. Who is Stephen Paddock and why do we no so little about him? When did security guard Jesus Campos get shot (if indeed he did) and what exactly is the timeline? Where is star witness Jesus Campos, the only reportedly to confront Paddock and who had promised days ago to make the rounds to 5 different media outlets for interviews, including Fox's "Hannity" and then suddenly canceled on all the interviews and still hasn't surfaced, concerning people who know him. The "why", or the motive remains a mystery, despite surfacing stories that MGM CEO James Murren divested 80% of his stock just a few weeks before the attack, and right on cue, hedge fund manipulator George Soros also made millions. And how is it, that the media continues to look away from eyewitnesses that heard gunfire inside of OTHER hotels and very convincing evidence that their were more than one shooter, not to mention the financial motive already mentioned? These are only some of the questions. As the timeline for the Las Vegas shooting came into question, things only seemed to get more cloudy as a critical person in the case vanished. Jesus Campos, the security guard that may have had an interaction with the shooter, is suddenly nowhere to be found. His family and friends are searching for him as the media sets out to follow up on several interviews Campos walked out on. His last known whereabouts are not even clear at this time; there are questions about him possibly seeking medical care before disappearing. In the week after the Las Vegas shooting, it was initially reported that Campos was shot after the majority of the gunfire was fired at those attending the concert. Police later changed the timeline to reflect that they believed Campos interacted with the shooter before the concert shots were fired when he was shot. Now there are questions concerning if Campos was even shot during the incident. It seemed that Campos was ready to address these questions with the media as he requested time to tell his story to the public. He was able to meet with union reps from the hotel and had scheduled to do several television interviews after that meeting. Instead of meeting with reporters, Campos vanished. Campos had taken steps to access the media to tell his version of the events. He was also under a great deal of stress tied to questions from the local police, the FBI and the MGM since the timeline seemed to be continually changing. On the surface, it appears he may have walked away from the media attention for a break. A union rep from the MGM speaks to the media about Campos missing. What makes this disappearance even more startling is the fact that there were also reports that he was taken to a local hospital for treatment. Those stories have not disclosed what the medical issue was, merely that a union representative received a text that Campos was being transported to a “UMC Quick Care.” With eight locations in the area, no one seemed to know which site he was seen at or if he ever made it there. This could be the last place he was seen if they are able to confirm he was in fact seem. 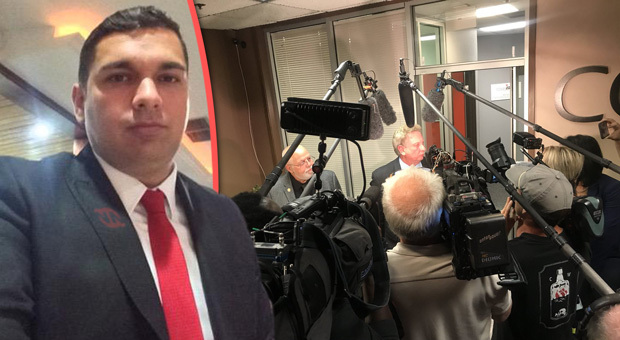 A local media outlet in Las Vegas attempted to make contact with each of the UMC Quick Care location, but they were not able to locate anyone that had seen Campos. This could mean he was not treated at any of the sites or it could also mean the clinics are not able to share any information due to patient confidentiality. Medical information is protected personal information that is not legally able to be shared with the public so it’s not unusual that this would not be shared. At this point, Campos may have been seen for the last time. Another thing that makes this case even more complicated is that it was confirmed that his family had been placed under a gag order. They are not allowed to talk to the media or make public statements. The panic tied to Campos suddenly going missing is being multiplied by the fact that there were fake news stories printed about Campos being arrested linked to the shooting. It was reported that he was not injured in the shooting but instead involved in the crime. For a short time he was identified as a second shooter. Reports of this arrest have all but vanished from the online news sites. There are several theories about where Campos could be. Some fear that he was treated for some mental distress tied to the shooting and perhaps is in danger. There are others that wonder if he was taken into protective custody related to the fact that his family is under a gag order. Still, others hold onto the idea that he was involved in a more significant conspiracy and has just vanished.